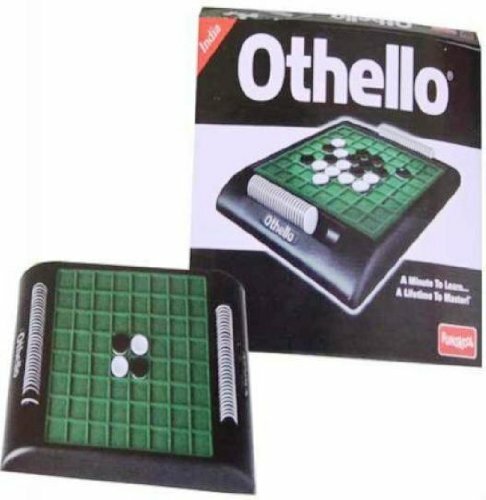 Othello is the game that takes a minute to learn and a lifetime to master. The lead can change hands from play to play and strategy is everything. Play is simple. Players are represented by either black or white discs on the board. On each turn, players flank the discs of the opposing player between two of their own. Once captured, the double-sided discs are flipped over and become the opposite color. If you have a move, you have to take it. Play ends when one player can't make any more moves or the game board is full. The player with the most pieces of their color facing up wins. The more you play, the more certain strategies emerge, and the more likely you are to lead your opponent right where you want them.